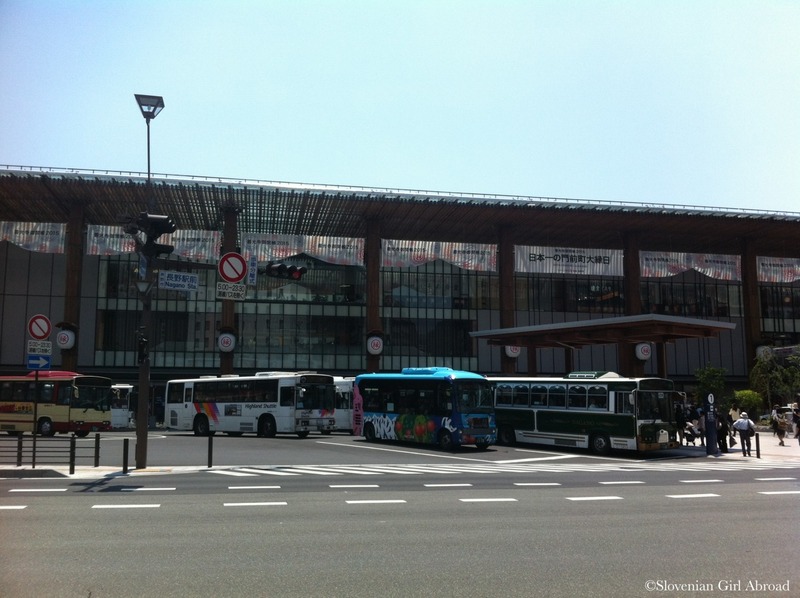 Our trip began at Ueno station where we took the shinkansen to Nagano. It was our first ride with this bullet train. We’re used of fast, comfortable and relatively clean Swiss trains, but shikansen did surpassed them all. The seats were super comfortable, there were more than enough leg-room and were impeccably clean which was a bit of surprise considering how many people we saw eating at the train. In about 80 minutes we’ve travelled the distance of 218 km and reached Nagano. 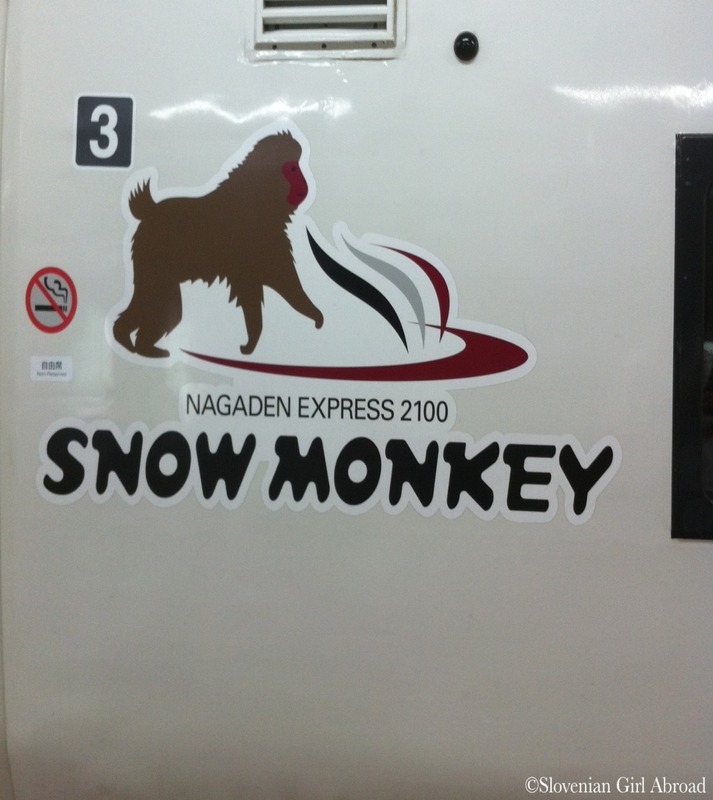 From there, there are two ways to get to Jigokudani monkey park: by bus or by train (Nagano Dentetsu Line) and bus. Unfortunately, none of the options is covered by the JR Pass. We decided to take a train. 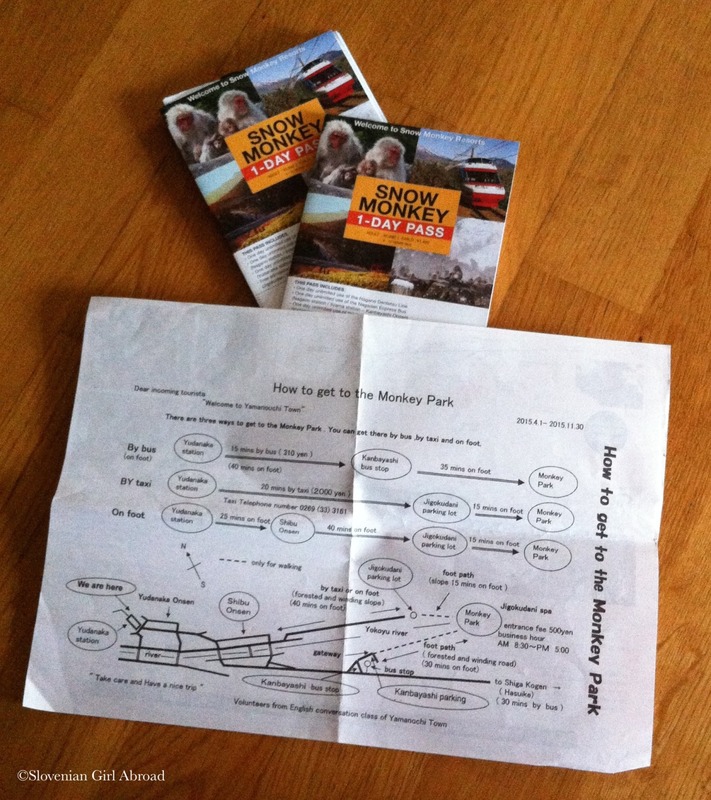 We bought a day-pass which covered the train ride from Nagano to Yudanaka, bus-ride from Yudanaka to Jigokudani monkey park and the entrance fee for the park. We had to wait for about 40 minutes for our train to depart, so we took a stroll around Nagano, the city probably best known as a host of 1998 winter Olympics. The Olympic heritage can still be seen around town, but we didn’t have nor time, nor enough interest to explore it. We were both too excited to continue our journey to Jigokudani. After a short walk on the streets of Nagano, we found a lovely bakery. We’ve grabbed some delicious pastries and some kind of pancake with ice-cream and berries and return back to the train station where our train was ready to depart. 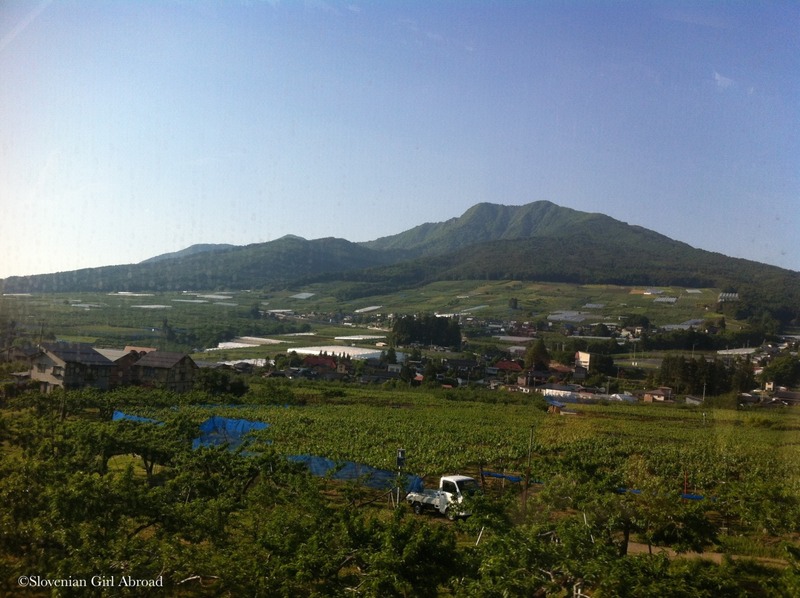 The train we took was a local train and stopped at almost every station between Nagano and Yudanaka. It was supper slow, but we still enjoyed the scenic ride through Japanese countryside; past the rice fields, orchards and vineyards. After 44 minutes we arrived to Yudanaka. Again, we had few minutes before departure of our bus. We bought some cold drinks at the vending machine and waited for a bus. 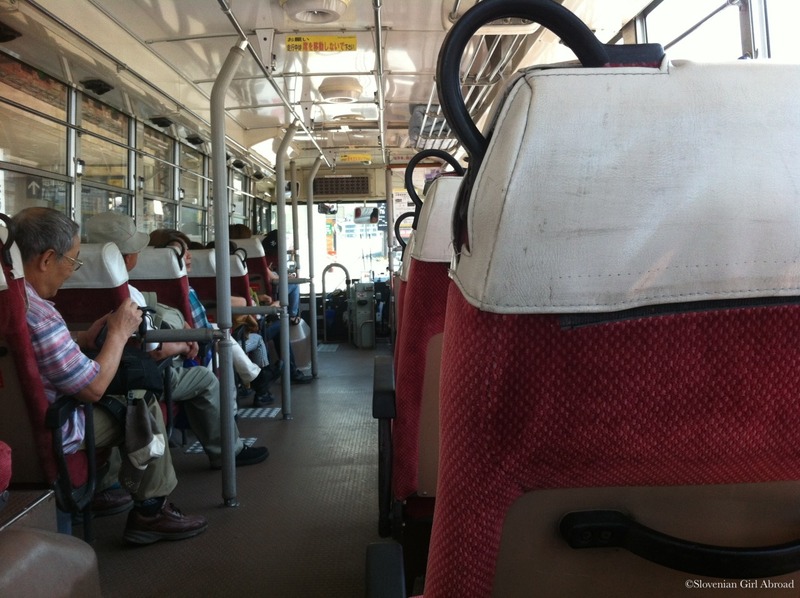 After our arrival to Japan, we were traveling with modern means of transport. This bus was therefore a huge surprise. It was probably made even before I was born! Though, it still worked perfectly and safely transported us to the Kanbayashi Onsen from where we followed the signs and continued our journey by foot. 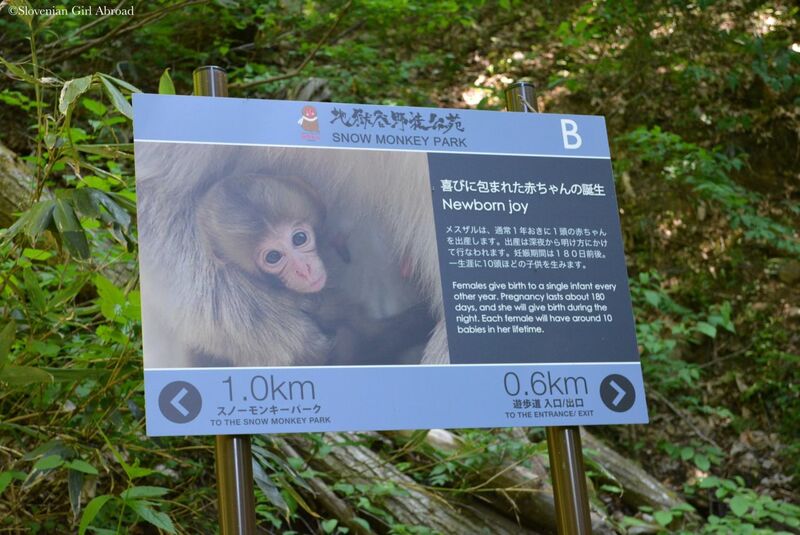 After about 30 minutes of walking through the woods past the panels explaining the life of macaque monkeys, we arrived to the entrance of the park. 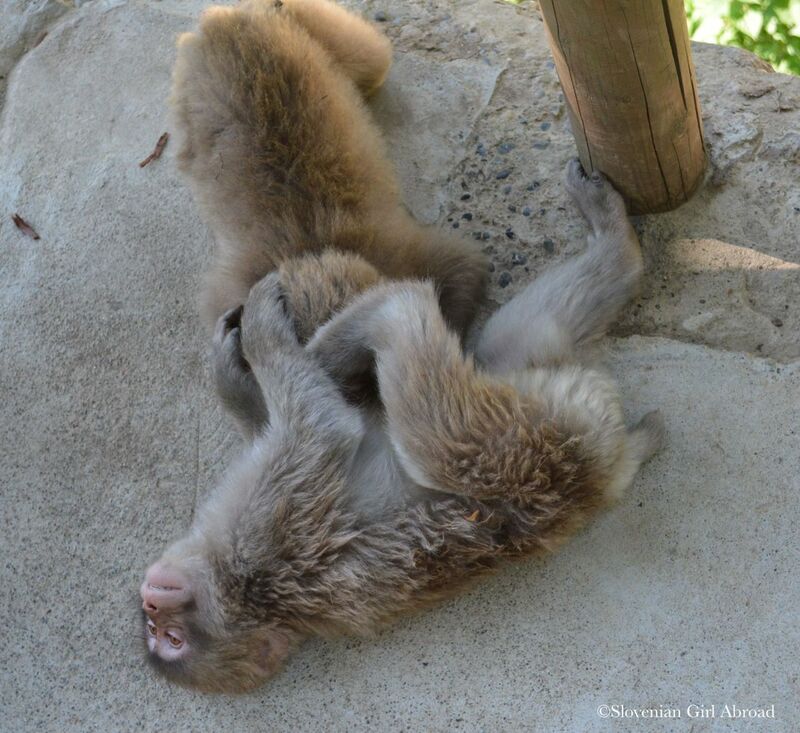 Even before the official entrance of the park, we saw monkeys chilling out in the shade on the paved road. It was amazing sight! We’ve continued our walk towards the entrance where we showed our passes and enter the park. 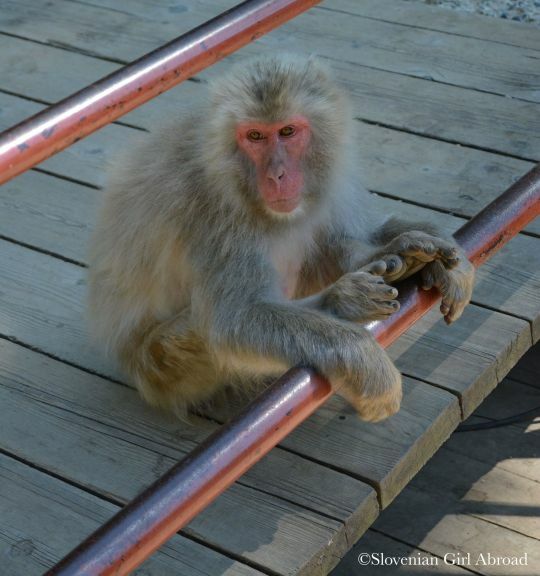 The Japanese Macaques live in the forests, up in the mountains. Every day after the morning meal, they come to the valley where they spend their day. In the evening they return back to the woods where they spend the night at their nests on the trees. 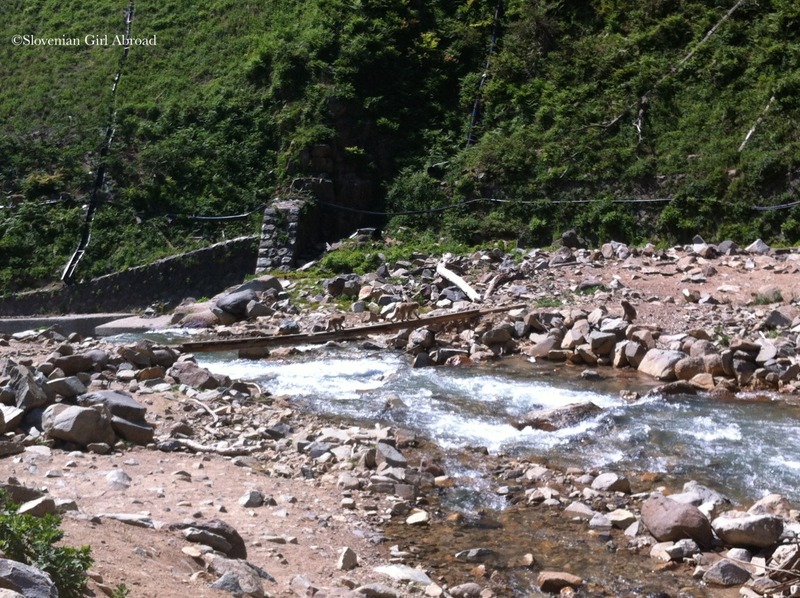 We were at the park in mid-day, at the time when the monkeys were in the valley. 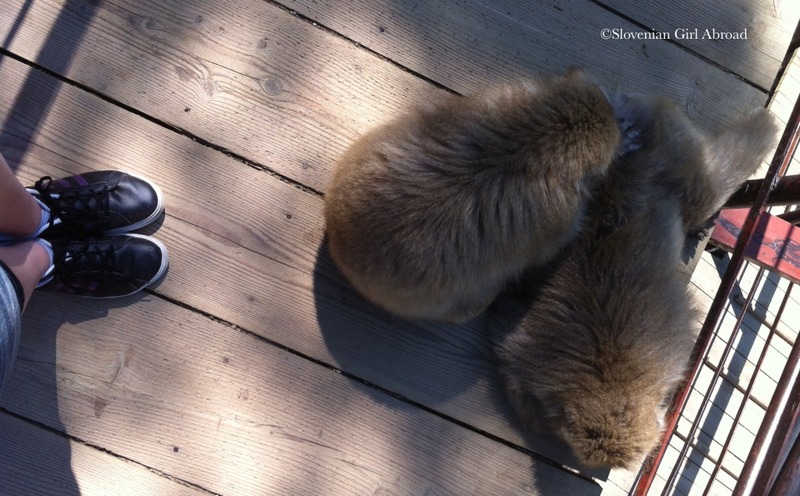 Some of the them were sleeping, some were searching for food between the rocks, others were cleaning each other’s fur. Youngsters were playing, babies were hugging their mothers. None seemed to be bothered by our presence. 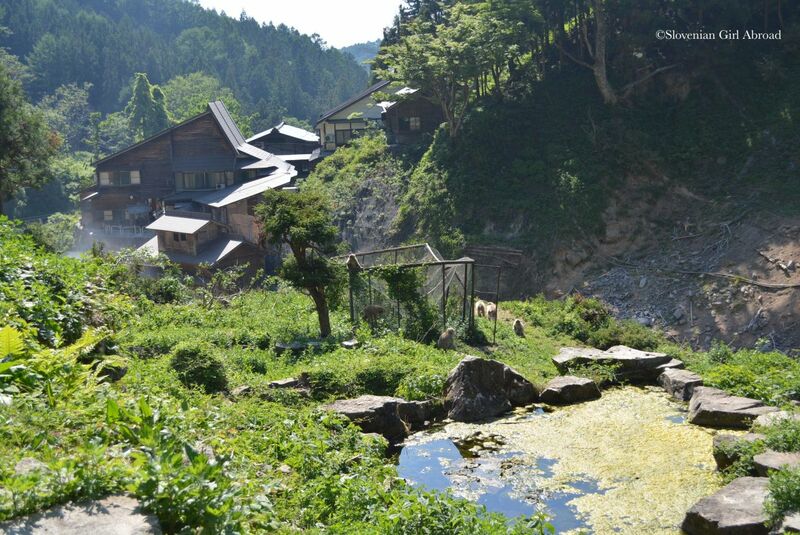 The are of Monkey Park is full of natural hot springs after which the valley got its name: Jigokudani aka “the Hell Valley”. 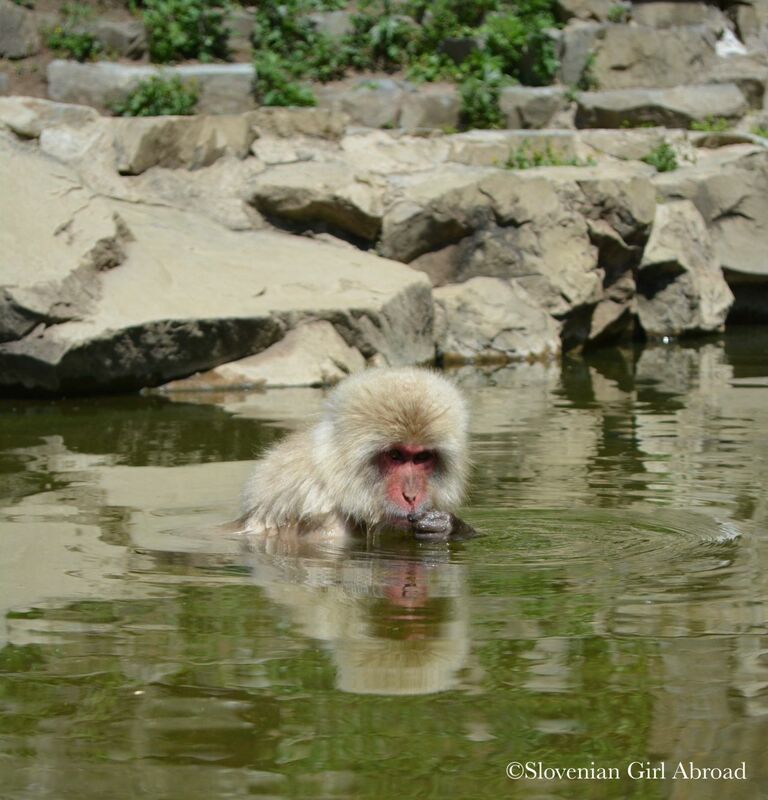 Monkeys discovered the benefits of those hot springs and occupied some of them. In the winter they love to warm themselves in the warm water. We were visiting on a hot day in May. Although the temperature of the water in the pool was lowered, was not surprising, most of the monkeys didn’t fancy a bath. 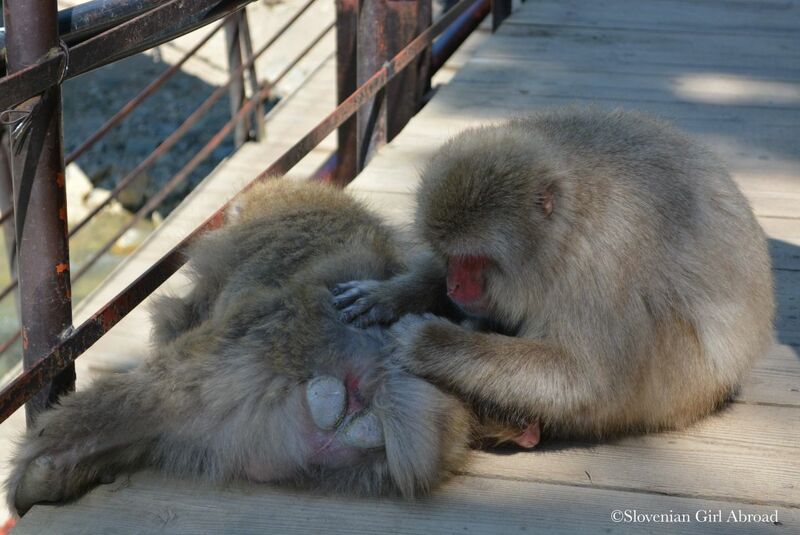 We only witnessed three monkeys went to the water: one adult and two youngsters who were playing and swimming. The setting of the park, in a valley by the lovely river, is gorgeous, but there are some industrial debris scattered around spoiling the beautiful setting. But, honestly I didn’t care much about it as I was more interested in observing the monkeys. After spending some time at the park observing the monkeys, it was time to return back to Tokyo. On our way back to the bus station, we’ve stopped by the souvenir shop and got into a chat with the kind seller who used to work as a cabin crew for ANA. We talked and the time flew by. We’ve just missed a bus, we were hoping to take, so we’ve waited for the next one at the nearby restaurant. 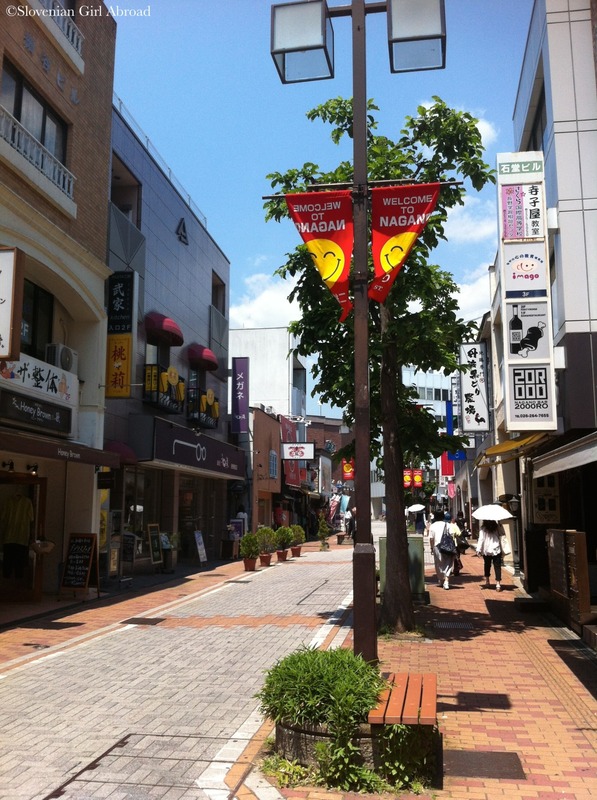 Without any further issues, we’ve returned back to Tokyo, richer for new amazing experience. 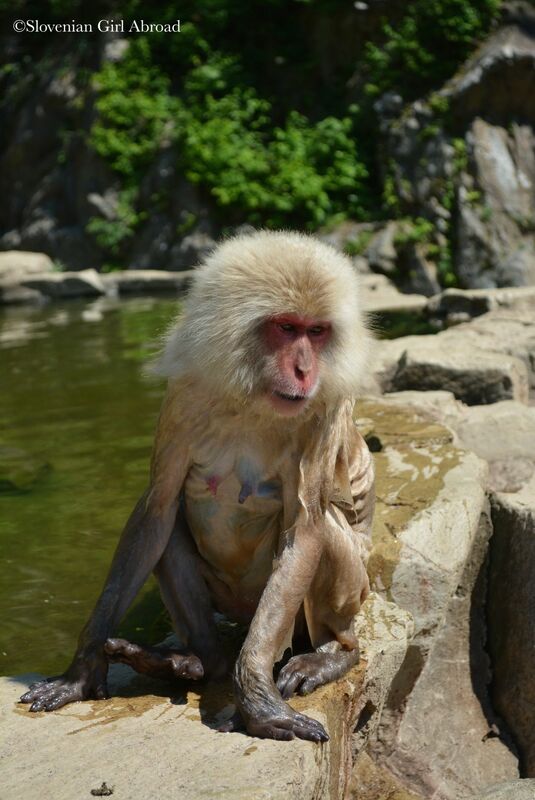 Visiting the Snow Monkeys was a great choice. I loved that visit also and actually visited twice. You have some great memories. Nice, detailed post. 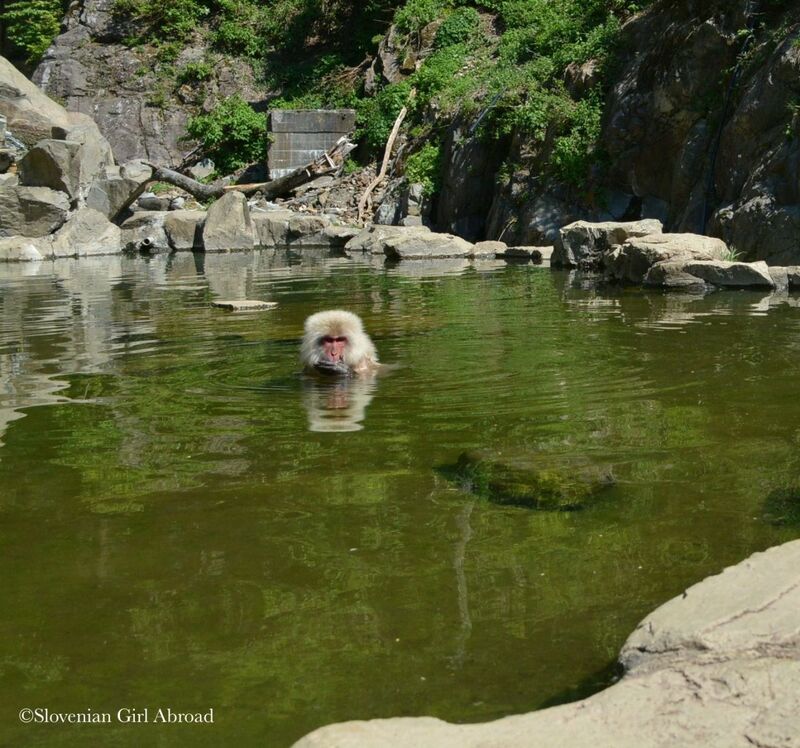 When I went here it was middle of winter, and the monkeys looked very cold – they were happy to stay in their hot spring baths! Interesting, I never saw any monkeys crossing bridges lol. Would love to see them one day, great photos. If you’ll have a chance, go there to see them. They are amazing. 🙂 Thank you! Thank you for the tour. I’ve always wanted to see the monkeys! Beautiful! I, myself would love to see them one day. Nice! I’m actually just checking how to get to this place 🙂 We are planning to go in May, just like you did. tole bo pa dreba it… hudo. bravo,.